Now type in your codename and password. 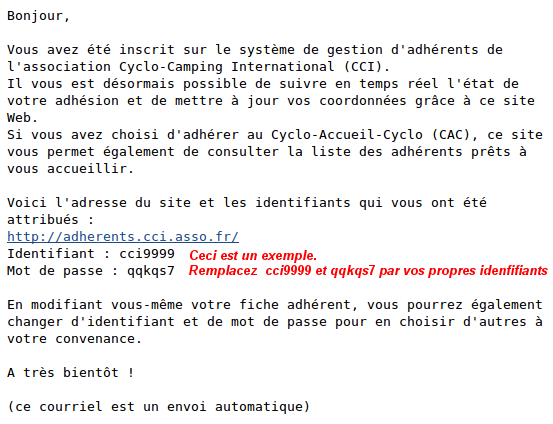 When you joined the CCI (membership form) you should have received an e-mail with your codename and password. If it didn’t arrive, or if you’ve lost it, scroll down and all will be explained. We’ve added you to our growing list of members. Thanks for joining us. You can now follow your membership and change any details through this website. And, if you joined Cyclo-Accueil-Cyclo, our mutual hospitality scheme, you can now plan your tours by finding members happy to put you up for the night. They’re chosen at random by our computer but you can change them to something easier to remember. It’s that same computer that’s written this message, by the way. It’s useless at conversations, so please don’t reply to this message direct. To connect for the first time, use the codename and password that the computer chose. They’re case-sensitive, so use capitals if they’re there and not if they’re not. The same for spaces. You may find it better to copy and paste, especially since l looks a lot like 1. To sign in, delete the sample numbers in the form shown below and type or copy in the details the computer sent you. 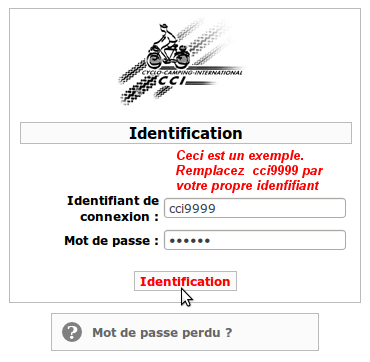 Click on “identification”. When you’re connected, you can change your codename and password to something easier. If that doesn’t work, follow the instructions below. But don’t keep on trying because more than 10 failed attempts in a day will block your account for 24 hours. How do I find my lost codename and password? That will take you to a page like the one below. Write in your e-mail address and then type in the two security words you see. Doing that shows you’re not a web-crawling program. 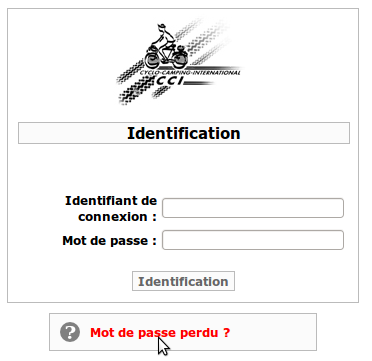 Now click “Envoyez-moi mon mot de passe”. We’ll then send you a message with the password. 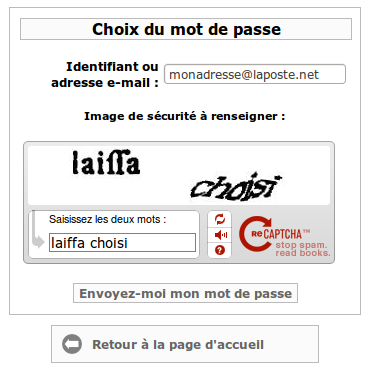 Don’t click “Envoyez-moi mon mot de passe” more than once or you’ll get a message for each click. 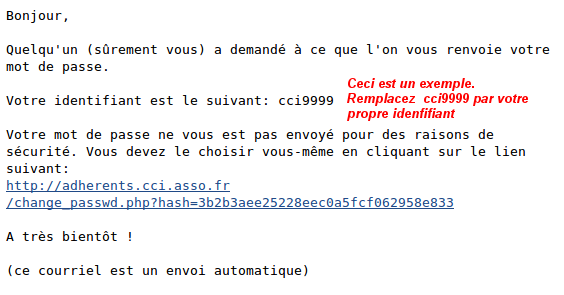 If the message doesn’t arrive, wait a few minutes and check your spam. Someone (you, probably!) has asked us to send your log-in details. Type your password in the first box, with at least four characters, then type it again in the second box as confirmation. 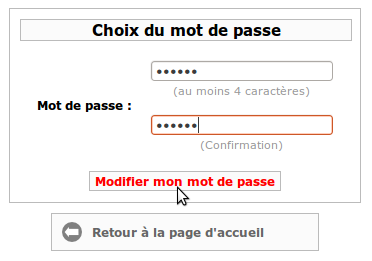 Now click “Modifier mon mot de passe”. The final box, in light grey, will take you back to the home page if you want to go there. Your password has been changed. We’ll take you back now to the home page. 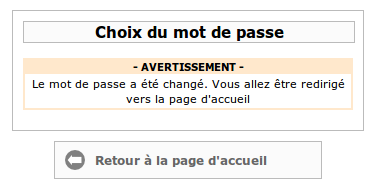 Click on “Retour à la page d’accueil”. Oh dear, you’re having problems, aren’t you! But we can still help. Send us a message by clicking here. and tell us your first and family name. Add your slow-mail address so we don’t confuse you with someone else. You can do this in English, by the way. We’ll get back to you as quickly as we can and we’ll sort it out together.